Weather is an abstract concept when discussed from the confines of an indoor classroom. Outdoors weather can be a concrete learning experience that provides interaction with all of a child’s senses. A child can hear the wind, feel the wind, and see trees swaying in the wind. Air actually has a smell just before it rains, while rain affects all senses. Items needed to create a great outdoor preschool weather station might include: thermometer, rain gauge, barometer, weather vane, and a place to record the weather at different times of the day. 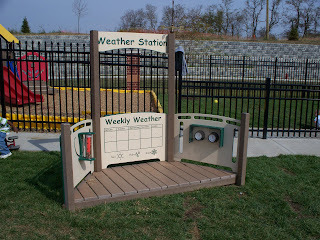 Each day at the end of outdoor play time, use the weather learning center as a transition point before going inside. Discuss the temperature, is it cloudy or sunny, will it rain based on the barometer, etc. The Adventurous Child web site has a great list of Early Learning Standards that pertain to the weather. Please send me your ideas or questions on creating an outdoor classroom for preschool children.